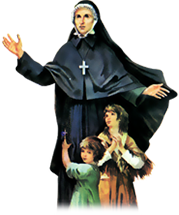 ST. CLAUDINE THEVENET was the woman called by God to form the Congregation of the Religious of Jesus & Mary. Her work was born in a heart crushed by the pain of personal tragedy during the French Revolution. Her brothers were shot to death before her and her family was distressingly scattered. Claudine was then 19 years of age and this event was a decisive turning point in her life. God works in such wondrous ways to realise His designs. She concluded that in all the violence she witnessed there was more ignorance than malice. The thought of those who live and die without knowing God haunted her and caused her anguish. Far from closing in upon herself in suffering, she opened her heart to the miseries surrounding her. Led by the spirit, Claudine first opened her door to welcome two orphans - a door which would never close. Many young people would later cross the threshold of the Houses founded throughout the world. Her response to the call of God took form in the total commitment of herself to the following of Christ. A Religious Family was born in the Church..... THE CONGREGATION OF THE RELIGIOUS OF JESUS AND MARY.Claudine's ideal was to make God known and loved by means of CHRISTIAN EDUCATION in all social milieux.This ideal remains the aim of the Congregation with the preference, inherited from the Foundress, for the YOUNG and among these for the poor. Women, whose very PRESENCE anywhere would exude GOODNESS and to touch other lives. To be a living WITNESS in their own lives..... of the values they teach. To have FORESIGHT and THOROUGHNESS in preparing and carrying out their duties. To have a great SIMPLICITY in doing all things to please God. To be CLEAN AND ORDERLY in their work and in their personal appearance and without pretence. of prevention that foresees and forestalls faults, giving guidance at the opportune time.... there is a greater delicacy of love implied in removing obstacles than merely healing wounds. of social formation.... to take their place in Society with confidence. a stimulating pedagogy giving each one the taste for going beyond self,for making a reality of the dream which God has for each one of His children. Hers was a PEDAGOGY OF LOVE....... A love that she drew from the Heart of Jesus pierced on the cross for the salvation of all men. Different social structures and environments require new forms of presence and make new demands on our creativity; but today as in the times of Claudine Thevenet the work of EDUCATION IN LOVE REMAINS THE BEST reform we can offer. The finest methods effect nothing without love.